ab21270 will recognize all three isoforms of TEM8/ATR. Synthetic peptide corresponding to Human TEM8/ATR (internal sequence). HepG2 whole cell lysate (ab7900) can be used as a positive control in WB. Our Abpromise guarantee covers the use of ab21270 in the following tested applications. WB Use a concentration of 0.5 - 1 µg/ml. Predicted molecular weight: 45 kDa. Plays a role in cell attachment and migration. Interacts with extracellular matrix proteins and with the actin cytoskeleton. Mediates adhesion of cells to type 1 collagen and gelatin, reorganization of the actin cytoskeleton and promotes cell spreading. Plays a role in the angiogenic response of cultured umbilical vein endothelial cells. Detected in umbilical vein endothelial cells (at protein level). Highly expressed in tumor endothelial cells. Defects in ANTXR1 are associated with susceptibility to hemangioma capillary infantile (HCI) [MIM:602089]. HCI are benign, highly proliferative lesions involving aberrant localized growth of capillary endothelium. They are the most common tumor of infancy, occurring in up to 10% of all births. Hemangiomas tend to appear shortly after birth and show rapid neonatal growth for up to 12 months characterized by endothelial hypercellularity and increased numbers of mast cells. This phase is followed by slow involution at a rate of about 10% per year and replacement by fibrofatty stroma. Belongs to the ATR family. Binding to PA occurs through the VWA domain. Cell membrane. Cell projection > lamellipodium membrane. Cell projection > filopodium membrane. At the membrane of lamellipodia and at the tip of actin-enriched filopodia. Colocalizes with actin at the base of lamellipodia. Western blot analysis of TEM8/ATR in HepG2 cell lysates with ab21270 at (A) 0.5, (B) 1 and (C) 2µg/ml. Western blot analysis of TEM8/ATR in HepG2 cell lysates with ab21270 at (A) 0.5, (B) 1 and (C) 2µg/ml. TEM8/ATR was immunoprecipitated using 0.5mg HepG2 whole cell extract, 5µg of Rabbit polyclonal to TEM8/ATR and 50µl of protein G magnetic beads (+). No antibody was added to the control (-). Proteins were eluted by addition of 40µl SDS loading buffer and incubated for 10min at 70oC; 10µl of each sample was separated on a SDS PAGE gel, transferred to a nitrocellulose membrane, blocked with 5% BSA and probed with ab21270. Heat mediated - Buffer/Enzyme Used: 0.01M Citrate buffer pH6 65&apos;c 60min. 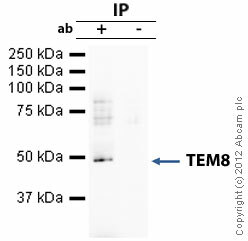 Will this TEM8 antibody cross-react with CMG2 Receptor? Thank you for contacting us. We have not tested ab21270 for cross-reactivity with CMG2, but it would not be expected to react due to 23% sequence homology with the immunogen. I hope this information is helpful to you. Please do not hesitate to contact us if you need any more advice or information. find attached a word document with answers. My results do not conclude anything about mouse. I am already trying to understand what might be happening and would be very grateful if you can clarify a few points: -there are several bands on all blots, I'd be very interrested to know their sizes but with only one MW marker am finding it hard to determine this (are the bands above 78kda close to 100kDa for example, or 80kDa?) These are criterion gradient gels from 5 to 15%. I’m not sure which bands you refer to. I’m including at the end of the file a scan with the complete gel FYI. -Looking at the western blots of the lysates, I see one band with the Mono (I guess this is the 80Kda band), but two bands both with the poly and the HA tag antibodies. I am wondering if the HA tag is not also a poly. In general polys do pick up better various forms of the proteins and it could be that those two polys are picking up cleaved forms of TEM8. Could this be the case? In the case of the poly, there are many bands but I can’t comment because none of them looks like the ones recognized by HA or the mono when you compare the MW or the shape. The lower MW band picked up by HA is not specific since it is found in the control lysate too. The band for TEM8 is seen as a doublet because it is a re-probing after using the monoclonal. When you strip blots, you take off the secondary antibody but not the primary, so you see it as an “empty space”. The HA tag antibody is a rat monoclonal and recognizes a tag in the C-terminus of the protein. -Looking at the IPed reprobes, it seems again to me that the poly anti TEM8 and the HA tags are giving similar band patterns, wether it was an IP with HA antibody or the poly. So with the IP with the poly it seems to me that the reprobe with the HA does give something, and as the TEM8 is expressed not endogenously in your cells I am wondering if again it could be because of a cleavage of the protein. Interrestingly IPing with the mono did not give a band at 80kda, so I conclude that the mono does not work well in IP, is this your opinion too? 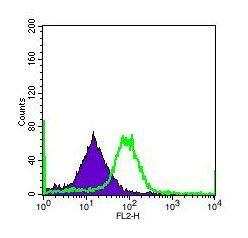 Yes, the mono is good only in western blots. The Ipps suggests that the Abcam antibody does IP Tem8 but what concerns me is that when you IP with Abcam and probe again with Abcam, you don’t see the expected band. I don’t think that it is a problem with Abcam Ab working in Western blots because it recognizes the expected band when Iped with anti HA. I don’t know what are the bands right below but I think it is unspecific because you see it in all 3 lanes with ipps and even in the lysates. I would be very grateful if you can let me know your thoughts on those points so I can better understand what might be happening in your experiments. The MW markers are: 200, 130, 78, 39, 32, 17, 7. 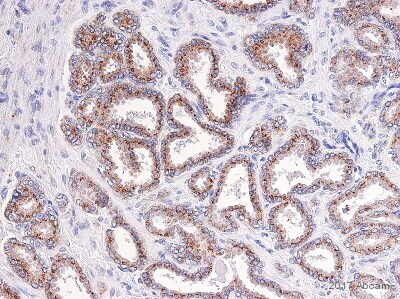 Thank you for your reply and providing more information and a whole blot image. Your problem puzzled me greatly and I also asked other colleagues to help understand what might be happening. Here are a few of our thoughts: -For the western blots: you said "The band for TEM8 is seen as a doublet because it is a re-probing after using the monoclonal. When you strip blots, you take off the secondary antibody but not the primary, so you see it as an “empty space”." Have you tried using the antibody on a fresh membrane? Stripping can damage the proteins and therefore prevent them from being detected by the second primary antibody. Furthermore if there is still primary antibody from the first experiment the second primary antibody will have more problems binding to the protein. -The Abcam antibody has not been tested on human samples, and as the protein is expressed in different isoforms/ splice variants we are wondering if the Abcam antibody is better at detecting one splice variant over an other, hence in our samples of mouse kidney it can detect the protein well in the three isoforms while in your samples the expression pattern may be very different. We would recommend to run a positive control of mouse kidney whole cell lysate to determine if this is the case. For the Immunoprecipitations: -The small strong large band in the IPed samples (HA and Poly IPed) and reprobed with the polyclonals could be the 60kDa form of the protein, and the strong large band could be the 45kDa form of the protein. As the poly has not been tested in IP, it's very hard to know if it is working optimally for this application. Again, having a fresh membrane would be useful to see exactly what bands are due to what antibody. As the antibody has not been tested in human samples I think the best recommendation I can make is to run a positive control along your samples; we do not guarantee ab19387 to work in human but I would be more than happy to offer you a refund or another antibody if you still have a problem with the positive control. 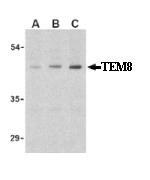 In September, I purchased the antibody cat# 19387 against TEM8 to be able to identify the 3 molecular forms of TEM8. I preferred this antibody over the other options offered in your catalog because there is a publication with this antibody and it comes from a lab with a good reputation. However, my experience with it was disappointing: It was prepared with a sequence of human TEM8, consequently it should recognize human TEM8. I tested it in Western blot and immunoprecipitation with cells expressing human TEM8 cDNA (see JBC 281:23227) and compared it to an antibody against the tag and a commercial antibody from another source. I'm attaching the results for your inspection. The last panel is a reprobing after the monoclonal antibody, therefore a blank band is observed in the samples with the highest levels of TEM8. As you can see, used in western blot, it is very unspecific and it does not recognize TEM8 as the main band in a lysate. It also doesn't work well in immunoprecipitation. Would it be possible for me to send this antibody back and try catalog # 21270, which also could potentially meet the features I'm interested in ? I'm sorry to hear you are experiencing unsatisfactory results with ab19387. I would be happy to consider offering you a replacement vial of ab21270, however before I can do that I would like to investigate this matter further to make sure that the problem with ab19387 could not be solved with a few protocol modifications. The quality of our products is of utmost importance to us and should we find out that ab19387 is of poor quality we will not hesitate to remove it from the catalogue. Can you please click on the link below which will take you to a short protocol questionnaire to help you put the information together, and could you please put it to my attention so I can personally look into this matter as I already have in hand the images you kindly provided. https://www.abcam.com/index.html?section=ip&pageconfig=technical∫AbID=19387&mode=questionaire I am already trying to understand what might be happening and would be very grateful if you can clarify a few points: -there are several bands on all blots, I'd be very interrested to know their sizes but with only one MW marker am finding it hard to determine this (are the bands above 78kda close to 100kDa for example, or 80kDa?) -Looking at the western blots of the lysates, I see one band with the Mono (I guess this is the 80Kda band), but two bands both with the poly and the HA tag antibodies. I am wondering if the HA tag is not also a poly. In general polys do pick up better various forms of the proteins and it could be that those two polys are picking up cleaved forms of TEM8. Could this be the case? -Looking at the IPed reprobes, it seems again to me that the poly anti TEM8 and the HA tags are giving similar band patterns, wether it was an IP with HA antibody or the poly. So with the IP with the poly it seems to me that the reprobe with the HA does give something, and as the TEM8 is expressed not endogenously in your cells I am wondering if again it could be because of a cleavage of the protein. Interrestingly IPing with the mono did not give a band at 80kda, so I conclude that the mono does not work well in IP, is this your opinion too? I would be very grateful if you can let me know your thoughts on those points so I can better understand what might be happening in your experiments. Hi Karen, Was it (peptide antigen for TEM-8) from the extracellular domain? That is all I need to know. Thank you for your enquiry. Based on prediction software, the epitope for the anti-TEM8 is extracellular. I hope this information helps. Please do not hesitate to contact us again if you need anything further. Thank you for your enquiry. The peptide was not selected from the transmembrane domain of TEM8. Unfortunately the exact sequence of the immunogen is proprietary. Please let me know if you have any more questions. Thank you for your enquiry. I am looking into the details of the immunogen for you. Meanwhile, I can tell you that this antibody recognizes all three isoforms of the TEM8 protein. As soon as I have any further information for you regarding the immunogen, I will let you know. I hope this information helps, please do not hesitate to contact us if you need any more advice or information.